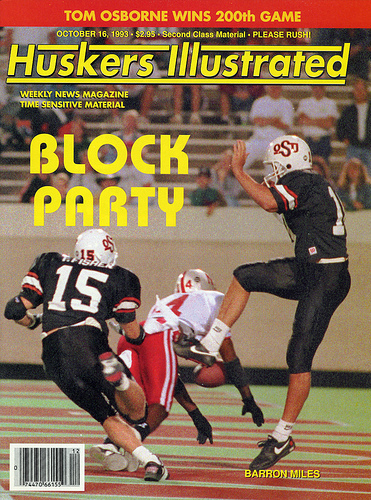 Blocking punts was a Barron Miles specialty. Q: Speaking of differences, did anything about the people of Nebraska stand out to you as compared to back home? BM: Yeah, everyone was white. (laughs) That was the biggest difference, just dealing with people that aren’t like you. And different language, different speech patterns, and you have to adapt to it. A lot of people don’t understand that when you come from an all-black neighborhood, an all-Spanish neighborhood, Asian, whatever it is, and then you get put into another culture, another environment, you have to adapt. And the quicker you adapt, the better off you’re gonna be. And some people adapt and some don’t. And that was another reason why I had to get away from home, because I wanted to grow up. If I ran into a problem in Nebraska I could write, ‘Mom, send me a plane ticket, I’m sick of this place. I want to come home.’ She would have been like, “Boy, I don’t have that money to get you a plane ticket. You’d have to wait awhile or you might have to figure it out.” Whereas, if I went to Rutgers or somewhere close to home I’d have been like, ‘I’m going home, and just hopping a bus or a train and I’m home.’ It was some big growing pains. Q: Sounds like Cortez’s Spanish explorers, forced to burn their ships before taking on the New World? No option of turning back? Q: Any tensions, tough moments with the local population? BM: Well, you’d get your tough moments every now and then, because I don’t look like a football player. The only thing that makes me a football player is the color of my skin, because most black-skinned people in Nebraska are pretty much athletes (laughs) so if you’re at the university and black, for the most part you’re on the football team, basketball team, track team. So just to be safe, they say, “Hey, how are you doing?” and try to learn something about you, to find more about you. Overall, I had a great experience in Nebraska. Q: Do you recall your first ties with the football organization-part of things? Anything stand out as to the way they ran things? Q: Matt Turman has a great story about Will Shields and discovering a totally different level of athleticism there at the university. As a matter of fact, Matt gave you an incredible amount of props for being a wonderful friend and mentor to him. BM: Oh? Nobody ever told me that. I appreciate it. But I know, when guys get on campus, upperclassmen normally shun them a little bit, “They’re taking my job, coming in for my job,” whatever. I wasn’t ever like that. If I play like I’m supposed to play, you’re not going to take my job, anyway. That’s how I feel. So my objective is to help you. If I can make you better, that’s gonna make our team better, and you’re gonna push me and I’m gonna push you. That’s the way it goes, whether you play receiver or offensive guard. Q: Did you arrive with that mindset? BM: I did. That was me. That’s why it was unbelievable. To this day, I still help my safeties. I know that they still all try to come take my job. I tell them, ‘Hey, if you can take my job, we’ll have a great team.’ They look at me like I’m crazy. “What are you talking about?” I say, “If someone asks you if you plan on taking Barron’s job, don’t say, ‘Uh, I don’t know,’ like you’re going to hurt my feelings…say, ‘Yeah! I’m here to take his job.’ ” Otherwise, you’re selling yourself short. Q: Did you come with that mindset yourself, was it instilled in high school? Where did you get that from? BM: Honestly, I don’t know. I think, because you’re small. I’m the smallest player when I play football. They say I have the “little man complex,” I don’t know. I’m always hungry. I knew the game, if I could help somebody else and it’s gonna make our team better, regardless. It doesn’t matter if I’m better than everybody if I don’t make everyone else better. What’s the use? You need 11 guys to win. BM: Yes, you’re right. I think we had a unique set of guys, because back then they were taking Prop. 48 guys, too. I was one of those Prop. 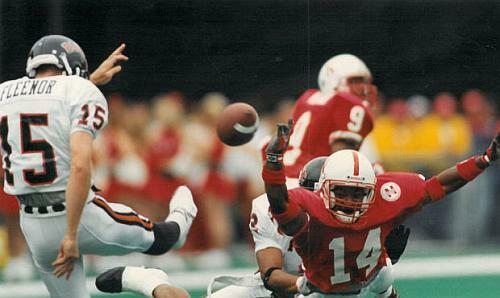 48 guys, we had maybe 5 or 6 Prop 48 guys my year, Troy Dumas and Abdul Mohammed, they played as freshmen, and the ‘Props’ that we had were so hungry and so determined to make an impact on the Nebraska team that once we got the opportunity it was like, ‘OK, I’m not letting this go.’ It carried over. It was like, ‘You just wait and see what happens when I get the chance to play.’ The work ethic was building, it was unbelievable. Because we all hung together. Q: That first year of sitting out really ‘killed’ you guys? BM: Yeah, it killed me so bad. I’m like, ‘Look at this. This is awful. I should be playing,’ you know? Q: Could you even practice with the team that year? Q: So your position was Coach George Darlington. Memories and recollections of Coach D? BM: Coach D? Tons! Awww! Coach D: “Follow your feet,” every day, every meeting. Him trying to show us how to backpedal was hilarious. (laughs) You know, he’d be, “Don’t backpedal like this..and then he’d trip over something.” (laughs) We had a ball, we’d go up to his house every year and just hang out, us DB’s. Hang out on the farm and he kept us together. He was pretty fair. If you could play he’d give you the opportunities. And even then, we knew the younger guys needed some playing time, so every now and then we’d share playing time with Leslie Dennis, Eric Stokes and those guys. If I’d have been, like, a senior, I would have been, ‘Hey, I’m playing. I’m a senior, I’m playing.’ If I’d have done that, if others had done that, we wouldn’t have been as good as we were. Tyrone Williams did the same thing. If a game got tight, we’d go back in the game and we’d finish the game, but for the most part we’d sneak them in and they got playing time. 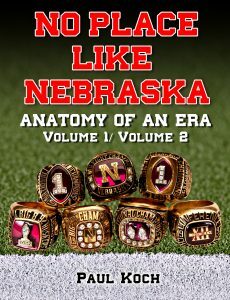 That was a testament to Tom Osborne in getting the guys in, and George Darlington, and letting the guys play and getting comfortable, getting in the game. Q: How would you, as players, let the guys come in? BM: The coach would come to you and say, “Okay, next series Leslie is going to take the left corner.” And you’d be like ‘All right,’ or ‘Hey, Coach, I’m in a groove, I want to play.’ Then for the most part, if Coach Osborne overrides it then nobody’s going in, it doesn’t matter what we say. (laughs) That happened one game against K-State. Coach Osborne walks down to me on the sideline while Leslie Dennis was in and says, “You should be in the game.” And I was, ‘Okay, I guess I should be in the game.’ (laughs) I ran back in the game and took Leslie out and that was the end of it. I think Kevin Lockett started catching some balls on Leslie and he said, “No, Barron, get back in the game.” I felt bad for Leslie, because when a receiver catches a ball you don’t want to be taken out of the game. You want to redeem yourself. It was kind of bad for him, but it was one of those games we didn’t want to lose and give them any momentum in Manhattan. Q: Any other coaches stand out to you? BM: Not too much, I’d just converse every now and then just to understand the defense and making sure everybody understood the big picture. If it was confusing for me, I knew half the guys didn’t get it on defense. I was kind of the measuring stick for everybody. Q: Who would you tell that to? Q: And what about Coach Osborne? BM: Great guy, great guy. Very trustworthy man. He came to my high school and flew back with me on my recruiting trip. That was a big step, that was huge. Little town of Roselle, and Tom Osborne the legend is showing up at your school and people just going crazy. That was very fun. That was interesting. Q: Do you recall the first game you played in? Q: Did all the players watch the T.O. Show? BM: Yeah, everybody watched it, especially after the game, because you got Coach Osborne’s opinion of different plays and how he viewed it, and it might be totally different from how you viewed it. So yeah, you’ve got to watch it. You’ve got to watch the show, now.